The International Uranium Film Festival will return this year to USA and show lots of films about nuclear power and uranium risks. And it kindly asks for your support and participation. 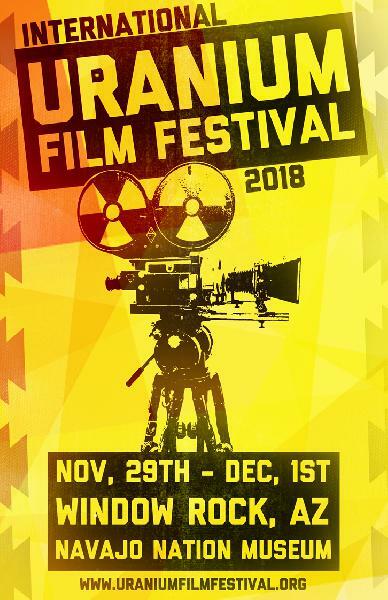 Kind request to support the International Uranium Film Festival that will be held in the Southwestern United States from Nov 29th through Dec 16th. We are finalizing our plans for showings at locations in Tucson and Window Rock, AZ and Laguna Pueblo, Albuquerque and Santa Fe, New Mexico. About the International Uranium Film Festival: Climate Change, the Peak Oil and the still growing hunger for energy of modern societies: At the beginning of the 21th century the world is - like at the beginning of the 19th century - again in the search for a new direction. Is nuclear energy the solution for Climate Change and the growing demand for Energy as it is claimed by nuclear industry and scientists like James Lovelock, the author of the Gaia theory? Windscale (Sellafield), Harrisburg (Three Mile Island), Chernobyl, Goiânia (Brazil): Radioactive and nuclear power accidents happen. Mining companies spreading around the world in search for new uranium deposits. And on the other side concerned citizens and indigenous peoples fighting against uranium mining projects in countries like Australia, India, Niger, Namibia, USA, Canada or Portugal. That was the background 2010 when we opened the film entry for the First International Uranium Film Festival (IUFF) in Rio de Janeiro – it was one year before the Fukushima reactor exploded. Starting in Rio de Janeiro the festival became a global event with festival screenings around the globe from Rio to Berlin, Washington, New Delhi and Window Rock. The International Uranium Film Festival is in fact the only annual film festival to highlight all nuclear and radioactive issues: nuclear fuel chain, uranium mining, atomic bombs, nuclear power plants, nuclear waste deposits - from Hiroshima to Fukushima. And the best and most important films of the year receive the Uranium Film Festival´s award. Now in 2018, we are returning to the United States at a time when there is renewed interest in restarting the Mt Taylor Mine located near Laguna and Acoma Pueblos and Grants in NM. Despite no operating mines in NM in the last nearly thirty years, the possibility that it could restart is tantalizing to locals communities that face economic hardships. The Uranium Film Festival is an opportunity to provide education and remembrance of what actually happened during mining operations and a look at the environmental and health devastation left behind. We are asking for your financial support to make this important event happen. We will be putting together a booklet that will include all showings in AZ and NM. Help us to show important films about nuclear power and uranium risks in the US and world wide. Current Festival supporters, partners and co-organizers of the Uranium Film Festival in the American Southwest are the Seventh Generation Fund, the New Mexico Social Justice and Equity Institute and the Multicultural Alliance for a Safe Environment (MASE). Be supporter and join us.